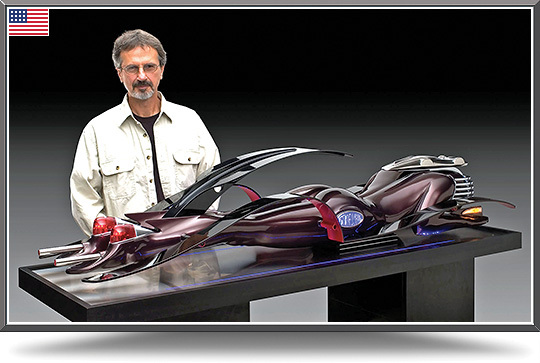 Richard Pietruska is uniquely talented: automotive artist, sculptor, designer, and teacher. His outside the box innovative thinking created the unique piece of automotive art above: Veronique GT – the Ultimate Driving Machine. This extraordinary, 6 ft. long illuminated artwork is crafted in fiberglass, aluminum, chrome, and stainless steel. It debuted at the 2005 Pebble Beach Concours d'Elegance and won the prestigious Peter Helck Award. Pietruska has been teaching transportation and product design at Art Center College of Design in Pasadena, California for over 20 years. During that time he has taught many of the world's top automotive designers. And since 1996, Richard has been a member of the elite Automotive Fine Arts Society. Back in high school, Richard won the Fisher Body Craftsman's Guild competition and received a scholarship to Art Center. From there he obtained both a Bachelor of Science Degree in Automotive Design and a Masters of Fine Arts Degree. Richard’s personal automotive art projects have ranged from paint, sculpture and tapestries, to a pair of coffee table cartoon books lampooning Porsche and Ferrari enthusiasts! More recently he has focused on bronze and cast resin sculptures. These dramatic works of art capture the essence of beautiful car designs at speed ... emotion in motion.Sometimes—like Veronique—even the human form is cleverly integrated into a piece. This artist continues to explore different media, materials and themes to broaden his portfolio of work. He has worked with Keith Collins providing designs for their exotic automotive tapestries. Other recent projects include graphic design and illustration, and exhibit and stage design. Articles about Pietruska's sculptures have appeared in various magazines, including Automobile, Road & Track, Rosso Ferrari, The Star (Mercedes magazine), Viper Quarterly, and Showcase. In fact he was commissioned to design the Car of the Year Award for Automobile magazine. Richard Pietruska's work is in many private collections around the world as well being exhibited in museums and Concours d'Elegance, including Pebble Beach, Meadow Brook Hall and Amelia Island.